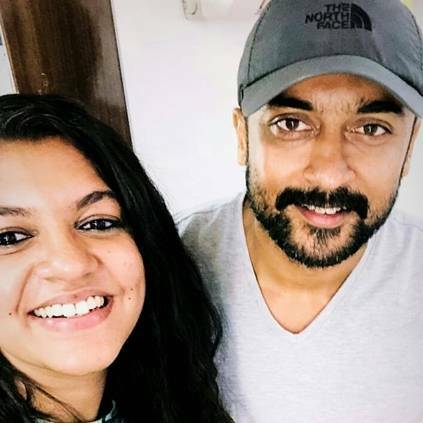 Actor Suriya is currently working on Sudha Kongara's Soorarai Pottru that has Aparna Balamurali as the female lead. He is also awaiting the release of Selvaraghavan's NGK that is slated to hit the screens on 31st May, and KV Anand's Kaappaan, that is releasing on 30th August. The shoot of Soorarai Pottru started one week ago with a Pooja, and sources close to us have revealed that the first schedule shoot has been completed. The film has Aparna Balamurali as the female lead, and GV Prakash as the music director. The project is co-produced by Guneet Monga's Sikhya Entetainment in association with 2D Entertainment, and the first look was launched on April 13. This will be Sudha Kongara's next film after the successful sports drama Irudhi Suttru that had Madhavan and Ritika Singh in the lead roles. Suriya was last seen in Vignesh Shivn's Thaana Serntha Kootam, produced by Studio Green. The fans are eagerly waiting to see their favourite hero after more than a year. Stay tuned for more updates. People looking for online information on Aparna Balamurali, GV Prakash, Soorarai Pottru, Sudha Kongara, Suriya will find this news story useful.